It's close to 18 lbs right now. The sink rate is deceptive in the video, the winds are pretty strong. It sinks at an angle of about two or three degrees with no headwinds. It's hard to get it to come down, it will fly with only two or three clicks of throttle. Once the engine gets broken in, the prop will be changed from the 19x8 to a 20x8. Wow 18 lbs, mine weighs in just over 10 lbs maybe with the float on another 3 lbs YS 1.20 lots of power. I notice no difference with the lifting tail I even have a cradle that fits on the top wing and take up gliders. I have increased the rudder by 50% and the elevator the same. I had a few bad releases where the glider ended up hung up and near cross ways on the cradle and I was sill able to land the thing with full control. It is one of my favorites for sure. I really like the Telemaster as well also a lifting tail. The lifting tail was not an issue at lower speeds. The lifting tail worked well with the narrow range of speeds possible with a glow engine. With a heavier plane and a 30cc to 40cc gas engine, the lifting tail created way too much down thrust which made the plane hard to control over a wide speed range due to the pitch changes. Going to a conventional tail and just using engine down thrust allows a wide speed range with no pitch changes or ballooning. I also increased the rudder size to help control the plane better at low speeds. Couple of other Lazy Aces in the club that have gassers they are no faster than mine a 10 or 12 pitch prop at 7 to 8000 rpm is actually slower than an 8 pitch prop at 10,000. They all have the original lifting tail no adverse effects. If speed was a problem then my vertical dive to landing should show a marked tucking under as I come straight down from altitude after releasing a glider so I can take the next one up. My speed in a dive far exceeds anything I have seen a Lazy Ace do on the flat and level. I even had one set up as a Triplane with 3 OS .61s it would drag the thing straight up from a short roll but wasn't much faster and far less fun then the lighter single engine. Last edited by Propworn; 03-19-2019 at 04:38 PM. All I can say is that mine started to dive at WOT. It was not stable in pitch over the entire speed envelope. With a symmetrical airfoil on the stab and engine down thrust, it is now stable at all speeds and does not balloon when the throttle is chopped. I'm not saying that my plane is faster than your plane, or any of the others, just that the lifting tail does not work correctly on mine over my speed range. Could it possibly have something to do with removing the stagger or any of the other changes you made. Not criticizing just trying to understand why yours displays a tendency to tuck at speed when none of the 3 or four I have flown have no such tendency. Power shouldn't be an issue one had a Supertiger .65, YS 1.20, 32cc gas motor and the tri motor. The heaviest I have flown mine is with the ashes of a departed friend to be spread over the flying field somewhere around 17 lbs. I did not know the cremated remains could weigh as much as 6 or 7 lbs and this was with that weight 6 inches above the top wing. No adverse flying characteristics. Last edited by Propworn; 03-20-2019 at 06:17 AM. It could be a number of things. I had to remove the wing stagger or add about three pounds to the nose in order to get the plane to balance correctly. I also have -3 degrees incidence in the top wing to make sure it stalls after the lower wing. There are a lot of tradeoffs in aeronautics. The plane is about 1 oz tail heavy right now since I added the 40cc twin. The engine is a little heavier than the 35cc and the standoffs are a little shorter, but the two changes did not cancel out exactly. It is not enough difference to cause any flying issues. Had to do an emergency repair at the field. 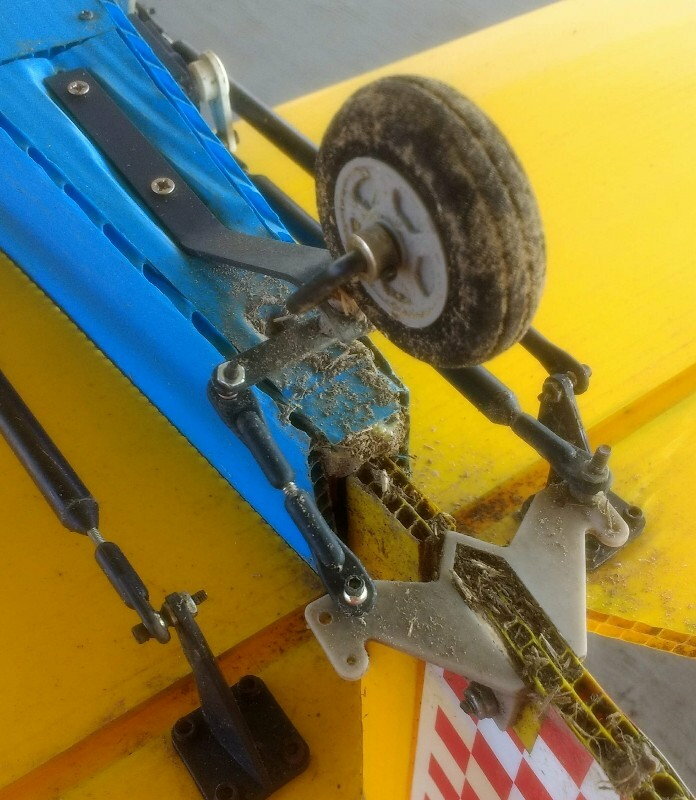 One of my tail-wheel springs broke and I didn't have a spare. This actually gives me better control in the grass. Yes, there is a heavy duty servo with metal gears, so it should hold up pretty well. Even if it does fail, there is a good chance it will be on the ground.